Belt buckle display cases and shelves. Award and collectible display case. Ribbon display shelf. If your ride or participate in rodeos, playdays, horseshows or other equestrian events, I know that you have your eye on the prize, that big shiny gold belt buckle. I hope that you have had the joy of winning one.... or several. I have and I know that buckles are something to be cherished. I keep a favorite one my belt to wear most of the time and the others are now mostly on my dresser or in the hands of friends and family that wanted to wear one. 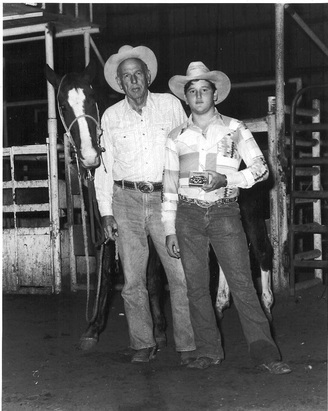 My younger brother posing with my grandfather while winning a buckle. We all love rodeo and have passed the tradition on down to our children and grand children. A couple of years ago, my older brother was wanting a way to display some buckles on the wall. He has a large collection of his own from roping and we were left with many award buckles when my grandfather passed also. I was able to find a nice display case like these below and that worked out just perfect. These are crafted from solid wood and have a glass door to keep the dust out. There is a beveled edge on the shelves to keep the buckles in place. The back of the shelf is lined with felt. It all comes assembled in one piece so there is nothing to put together, just hang it with the brackets that are already attached to the back. These are something new to me and I was excited to find them. I know these will be a welcome gift and they are under 20 dollars and made by a company in the USA, so that’s great. 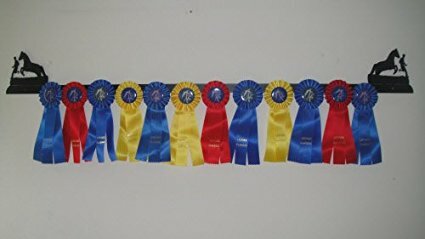 I was thinking that these would also be good as awards for weekly prizes in a rodeo or playday series event. * These are stands that will hold up to 3 belt buckles. * They are laser cut from 18 gauge steel with a black powder coat. * The stands do not hang, but are free standing. 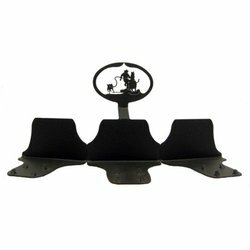 * There are 2 prongs on each base so that you can adjust the height of the buckles on your display. * They are 10 inches wide x 5-1/4 inches tall x 3-1/2 inches deep. * They Are Made In The USA. The manufacturer has this listed as individual roping. I know this best as breakaway roping. My younger brother in the very top picture ( many years later ) poses with my niece as she wins a buckle. The buckle stands below for barrel racing, pole bending and goat tying are representative of standard rodeo events. 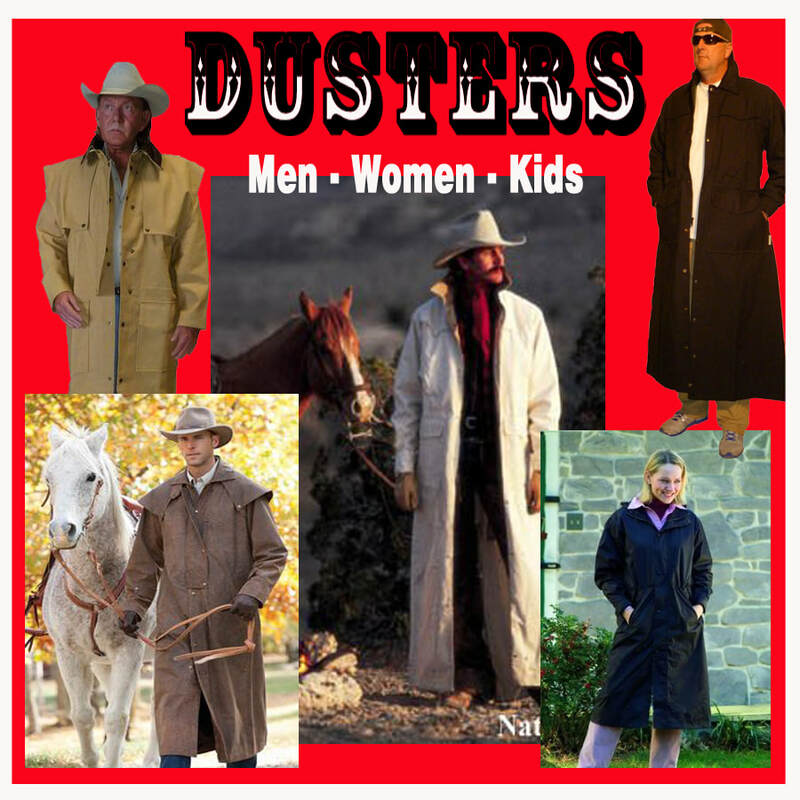 They will also be fine for other events and games like Straight Away Barrels, Speed Race, Key Hole or Goat Ribbon Pulling. This trip included winning 4 buckles and a saddle for All Around Cowgirl. Over the years my family has had many nights when we come ﻿home﻿ with a buckle, sometimes a saddle for our efforts. I suppose the biggest award of them all is just being fortunate enough to get to participate in theses sports and be active as a family. I won my first horseshow ribbon in 1966 and I still have it along with many more won throughout the years. That called for lots of pins in the wall. Wouldn't a ribbon display be nice. I looked around and found a few different styles. 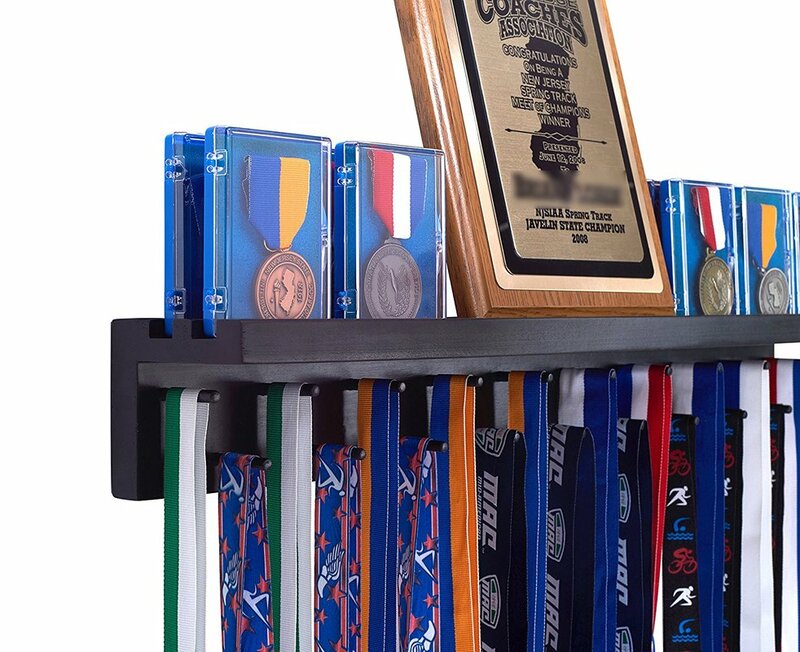 These powder coated steel ribbon racks come in a wall mount version that is 58 inches long and 6 inches tall and a stall mount style that is 32.5 inches long and 5 inches tall. 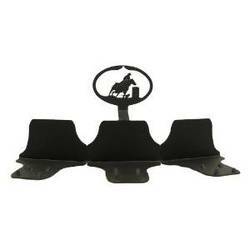 The stall mount comes with adjustable nylon straps to hand on your stall. 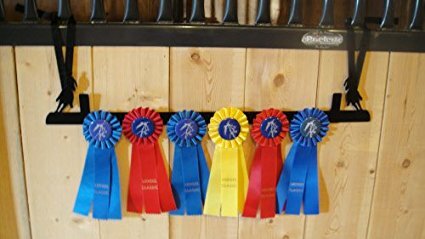 These are available with about 30 different events such as barrels, jumping, reining and poles. ​This is a 24 inch rack. There are a few other versions of this with different figures at the top. This looks like a good multi function shelf that has pegs to hang ribbons and shelf space for trophies, plaques, or belt buckles. See this close up in the second picture where there is 2 rows of grooves to stand up awards.